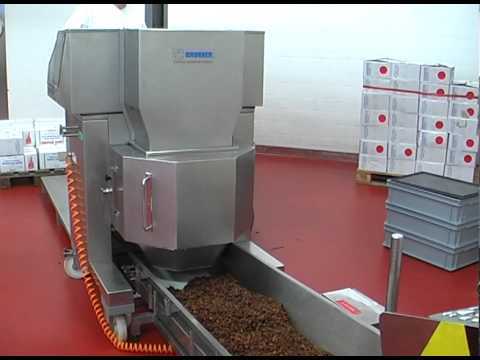 Breaking up dried fruit neatly, without damage, requires gentle and skilled handling. Processing by hand is time-consuming and using water is extremely inefficient, so a mechanical alternative requires flexibility to handle many different types of produce without puncturing or bruising it. Manufactured by Brunner Anliker, the FAM 11 guarantees gentle treatment of the produce, which is unpacked directly onto the machine. The entire block is then passed through the feeder chute onto a pre-breaking hook before being skilfully dismantled by co-ordinated tools that are specially designed and configured according to the type of product being processed. With a throughput of around 1,500 kg/hour, or approximately 100 blocks, the FAM 11 offers a much more efficient solution to traditional hand or water declumping methods.